The Pointe aux Barques Lighthouse near the tip of Michigan's Thumb marks a crucial turning point for vessels going into Saginaw Bay, warning boats of a shallow reef extending nearly two miles into Lake Huron. Pointe aux Barques ("Point of little boats") takes its name from the French fur traders who originally traveled the area in birch bark canoes, gathering there each spring to trade furs and take on new supplies before another trapping season. 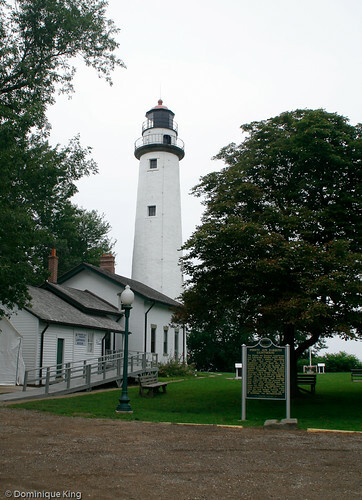 This lighthouse is among the 10 oldest lighthouses in Michigan, although it isn't the first light tower to grace this rocky point on the eastern shore of Lake Huron between Port Hope and Port Austin. President James K. Polk appropriated $5,000 to build the first lighthouse at Pointe aux Barques in 1847. The location seemed ideal and there was an abundance of stone along the shore to use as building material. 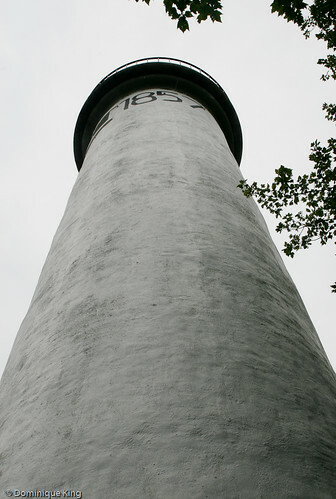 The first lighthouse likely had a short stone tower and small dwelling. A recent archeological dig by students and staff from Western Michigan University unearthed some evidence of the original light and its footprint. Peter Shook was the lighthouse's first keeper, arriving in 1848 with his wife Catherine and their eight children. Catherine took ill shortly after arriving at Pointe aux Barques, so Peter brought a doctor to the lighthouse to care for his wife. Peter and the doctor both drowned on a trip to return the doctor to his home. 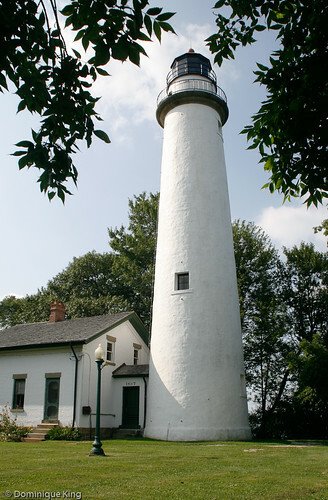 Catherine's appointment to take Peter's place made her Michigan's first female light keeper according to the state historical marker in front of the lighthouse. Catherine's troubles continued as a fire destroyed her family's home at the lighthouse in 1849, but she remained on the job for another two years. Further damage occurred at the lighthouse as the original construction and materials weren't strong enough to withstand the weather and waves, and the tower likely wasn't tall enough to be easily visible or effective. 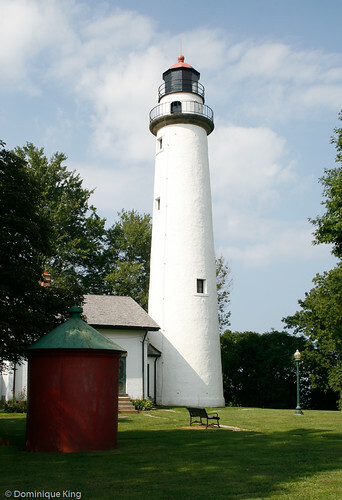 Plans to completely replace the lighthouse resulted in construction of an 89-foot-tall tower and attached dwelling of Cream City brick in 1857. The light with its Third Order Fresnel lens was visible more than 15 miles away on the lake. A new two-story dwelling attached to the tower via a short enclosed passage had an arch-topped cast iron door separating both structures as a way to deter any possible fires from spreading. In 1875, the Port Hope Life Saving Station appeared about 800 feet south of the lighthouse. Changes at the lighthouse over the years included: the construction of a round oil shed to store flammable oils away from the tower in 1892 (the little red building visible in the photo below), construction of an assistant keepers' home in 1908, electrification of the light in 1932, and retirement of the last light keeper with automation of the light in 1939. The Coast Guard decommissioned the life saving station and its 15 buildings in 1939, moving some of the buildings to the nearby Huron City complex of historic buildings. The 1950s saw the removal of the Fresnel lens and its replacement by more modern beacons. 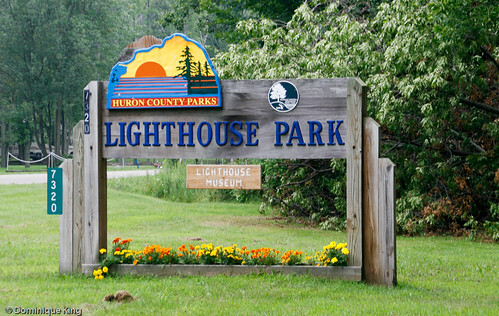 Huron County acquired the lighthouse and its grounds in 1958 to use as a park, campground, and lighthouse museum. Lighthouse County Park sits near on original site of the life saving station and has 110 modern and rustic campsites, a handful of rustic cabins, picnic areas, pavilions, and playground equipment. We've been out to the park at different times of the year, and it never seems overcrowded. We spotted only a few RVs and tents at the campground during our most recent visit in early August. The non-profit Pointe aux Barques Lighthouse Society, formed in 2002, currently maintains the site as a museum open from May through early October. We found the museum open, but not staffed, later than the posted hours during our last visit. 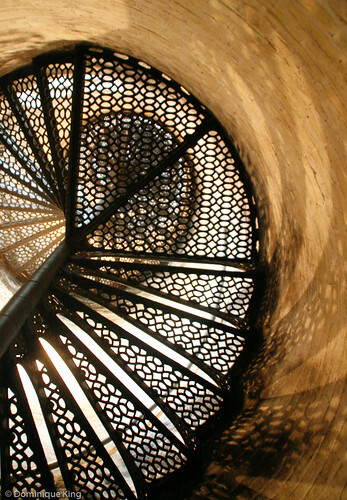 The light tower is not generally open to the public, although you can look up the spiral staircase from the foot of the tower. We just missed the annual Lighthouse Heritage Days in early August when visitors could climb the tower for a small donation to help fund Pointe aux Barques maintenance. Want to learn more about the tip of Michigan's Thumb? Check out Huron County Michigan by the Huron County Historical Society. I always find these little Arcadia Publishing volumes of historic photos and short histories a fun way to learn a little about places I visit. What a neat lighthouse. I especially like the shot of the spiral staircase. That's awesome. This is a very important fixture in my life. As a child in the 1940s & 50s my father loved fishing at Pt. Aux Barques. We either camped near the old log cabins, or rented one if weather was bad. I hung out at the USCG Station in admiration of who they are and what they did. After high school enlisted in the CG thinking it would be nice to be stationed in Michigan. Hah. Soon discovered the joys of weather patrols in the North Atlantic during winter storms. I loved it all. Alway visit this site when I visit family in Michigan. Only fond memories. Thanks for stopping by, Don. It's fun to hear how this particular lighthouse inspired your work as a member of the CG. Dominique, Hubby just asked me "Where was that campground with the lighthouse where we camped up in MI thumb?" I quickly did a 'search' & showed him these pics. Yep, that's the one! What a beautiful park! And I also love 'shooting' straight up the spiral staircases. We enjoyed our stay there for a few days while we traveled around chasing lighthouses! You have a BEAUTIFUL state! Loved every minute of our travels there! Jayne-Thanks for stopping by. Glad you enjoyed your stay at the campground and seeing the lighthouse. We love the fact that Michigan has so many beautiful light stations and that we've had the opportunity to visit many of them. Hope you are able to return and visit again soon!